Consumed by the music. Consumed as to take the shape of the melodies he's constantly looking for. An animal perfectly adapted to the music halls, as he sang in "Anonanimal". 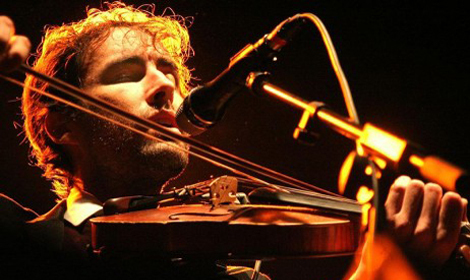 Last year, Andrew Bird brought everywhere his violin, from festivals to churches, from movies to museums. And after months on stage, he's back to give us an handful of his most precious songs ever. On the occasion of the release of "Break It Yourself", the American songwriter accepted to open for us his case of words, notes and old gramophones. You have been making music for many years, collecting a huge number of recordings since your debut with "Music Of Hair" in 1996, when you were just 23. How did your relationship with songwriting evolve since then? Looking back at your music path, what do you see? I see a restlessness from record to record but also within the songs. When I started making records I was still a student/fan of music, then somewhere before "Weather Systems" I was totally consumed by it. There's no style it's just me. "The Mysterious Production Of Eggs" represents an important step in your music career: it received many enthusiastic reactions from critics and fans and helped your music reach a wider audience. How you relate with that album? What does it represent to you? It took 3 tries and 4 years to make that record because I was teaching myself a new language. I still like playing all those songs. They are very well crafted. After the release of your previous record, "Noble Beast", you had an intense year of touring. In the documentary "Fever Year", Xan Aranda depicted that period and your state of constant fever... Could you tell us something about that feverish time? It was a rough time. It was like I had been on the road for 6 years and I was finally turning into an animal that lives in a cave in Mexico. Like my body temperature had changed to deal with constant performance. In "Break It Yourself" your music seems to need more space (and less additions). The role of your violin sounds even more crucial than it was in the past. Do you think the instrumental music you worked on since "Useless Creatures" had an influence on that? I think so. I was tired of quarantining the instrumental side and wanted to bring it back into the songs. Whenever I make a record like "Useless Creatures" or "Weather Systems" or "Fingerlings", where they exist to catch the overflow of ideas, people seem to really like them. For "Break It Yourself" did you work as usual in your barn? How was the recording process of the album? I have developed a lot of music in my barn but this is the first record I've made entirely in the barn. It was the most fun I've had making a record. It's mostly live. It's just four people playing music together. Let's talk about the album's title. How do you think we're able to break our hearts ourselves? I don't really think it's possible. That's sort of the point. When we are so self reliant though, who else could do it? When we get too close to the source things fall apart. In the last track of the record, "Belles", we can hear the sound of crickets. Do you think your music could be a soundtrack for the breath of the nature? The cover of "Break It Yourself" shows an image from the beginning of the twentieth century. Why did you choose that picture? My grandmother took if when she was 11 in 1915. I just think it's a remarkable photo pregnant with the future. You made an exclusive limited edition of your latest album (just 1000 numbered copies), that includes a double vinyl version, a CD version, a DVD and many other collectables. What is your relationship with (music) objects? Are you a collector yourself as well or did you just mean to make your addicted fans happier? My mother and many of my friends are artists so I enjoy collaborating with them. How do you relate with the past? Who are the most influent musicians/songwriters in your path, the ones who changed your way of conceiving music? Lester Young for improvising, Low for restraint. It's too hard to boil it down. What are you listening to, lately? Are there any artists that you recently discovered and especially appreciate? I just started getting into Townes Van Zandt. The gramophone is one of the most distinctive symbols of your music. What aspects of this instrument fascinate you most? It's modern but still a little Victorian so it has this naturalistic shape to it. You use to make many variations on your songs during your live performances, almost reinventing them every time. What does improvisation mean to you? I improvise to find melodies and there's nothing like finding a melody for the first time while people listen. Did your approach to live shows change after your "Gezelligheid" concerts, which were based on the idea of coziness? On Jan 28th 2012 you played a concert in a very peculiar location, called "A Room For London": a riverboat inspired by Joseph Conrad's "Heart Of Darkness" that sits atop Queen Elizabeth Hall in London. What kind of influence do places have on you and on your music's mood when you perform or record? I like having to adapt to my environment. It keeps things exciting. The boat from "Heart of Darkness" was especially inspiring. How worth are words? The more we repeat them, the more they lose their meaning, like letters aligned on a faded dictionary that no longer tell about experience. 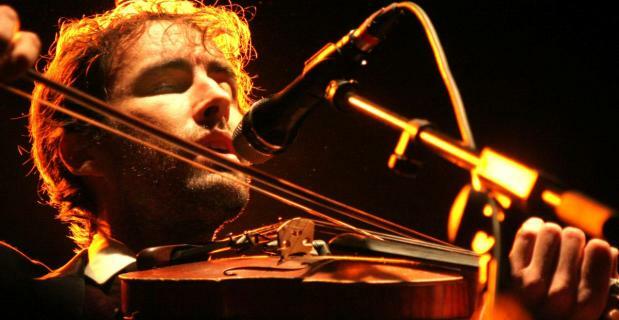 Nevertheless, for Andrew Bird things don’t go this way: in his music words are like the breath of a new creation, they come out again from nowhere to be defined in shape and colour. Back from his only Italian concert and with a new Ep ("Fitz And The Dizzyspells") coming out in these days, Chicago whistler Andrew Bird talks about how words fascinate him and how he faces his own (un)social, non-animal essence. Looking back at your music career, your soloist change - after the experience with the Bowl Of Fire - can be traced back to a performance in Chicago, dated Winter 2002, when you opened The Handsome Family's concert. Would you tell us about that night? I had spent the previous six months mostly in isolation in my barn space - a place I had built by hand. Perhaps to justify this isolation and loneliness, I created a new way for me to make and think about music. I didn't really realize what I was doing at the time and I still thought I needed a band to make legitimate music. I couldn't get my band to back me up for this show so I tried the looping thing and it worked better than I could have imagined. Your choice of living in the country, far away from big cities, might look like an isolation choice. While listening to your albums, though, one gets the impression that it was rather a way for you to recover the space you needed to deepen your sight into reality. This is true. I needed a different reality and one with more distant views, panoramic, open sky. But I struggled with the impulses that would drive me to be so apart from a social network. Sometimes people are the last thing to be considered. Or sometimes people require compromises and lowered expectations which I was tired of making. Yet I left classical music to seek a more natural social context for music. Your music is full of layers, but still it always keeps light. How is it possible to put together in a single track the richness in music and the simplicity of approach without degenerating into intellectualism or pretentiousness? Word seems to have a unique fascination for you: lexical refinement is a distinctive element in your songs, leading words themselves to become music. Are you intrigued with the concept of strength in words, in that "nomenclature" of reality you sing about in the new album? I am particularly fascinated or nostalgic on this new record with that era in natural history in the 19th century when new species were being named and I have been lamenting the overuse or devaluing of the everyday vernacular. I want to find the potential energy of language again. The moment before something is named. I seek out words that are beautiful and arcane to inject them with meaning again. "I will become this animal, perfectly adapted to the music halls", you sing in "Anonanimal". Is it a goal you reached in your music career or rather a kind of adaptation process, due to a simple "evolution of the specie"? I have chosen a profession that accommodates all my antisocial tendencies. I always have an excuse to not engage people so that I can engage them from the "safety" of the stage. I think this song is universal in that it asks what kind of animal you will allow yourself to mutate, evolve or warp into so that you can do your job. At what cost? What would you never like to be said about your music? Your songs are continuously evolving, they evolve during every live performance and you even add the same songs in multiple albums, giving them a new and different aspect every time. Just like Dylan, whose approach was compared to that of a painter continuously retouching his paintings, highlighting different details every time... Would this same comparison fit you? Dylan worked off a template and that demands that you expose yourself and keep the song human and alive. A song like "Imitosis" or "Why?" has a fertile template over which I can always create something new. You have to create your own resistance, especially solo, to know you are alive and present at that moment. Your tours are always rather exhausting: usually your performances are a concentrate of energy overwhelming everything, from stage to audience. You make something like 200 concerts a year, so it is natural to suppose that you have some kind of secret to help you bear these emotionally destabilizing experiences with such a high frequency. How do you keep the fire alive when you are on stage? Being exhausted is an altered state you either embrace or overcome. The deeper into a tour I get, the fewer inhibitions I have and I'm surprised by what comes out of me. You teach music at the Old Town School of Folk Music, and your appearance as "Dr. Stringz" in a TV show for children has become a little "cult". What are the most important aspect to be considered when teaching music? I haven't taught for twelve years. I could see myself teaching when I'm old, but only in a way where I can show students what I've taught myself. Rock music and classical music: sometimes the attempt to mix these two worlds may risk to debase the specific dignity of both. Given your classical music education, what do you think about it? Could you tell us something about your experience at MTV together with the notorious cellist Yo-Yo Ma? This question assumes a deliberateness and I just can't relate. Talking and playing with Yo-Yo Ma was cool but MTV did their best to make it lame. You are a renowned whistler, and whistling surely is one of the most peculiar aspects in your music. We would like to end this interview with a quotation by Boris Pasternak, who describes poetry starting from whistling: "Poetry is a rich, full-bodied whistle, cracked ice crunching in pails, the night that numbs the leaf, the duel of two nightingales, the sweet pea that has run wild, Creation's tears in shoulder blades". What do you think about it? It seems like a reminder to us to stay human and create friction. The tactile topography of sound. Sometimes it can become desperate, this push for humanness. We are up against a lot.